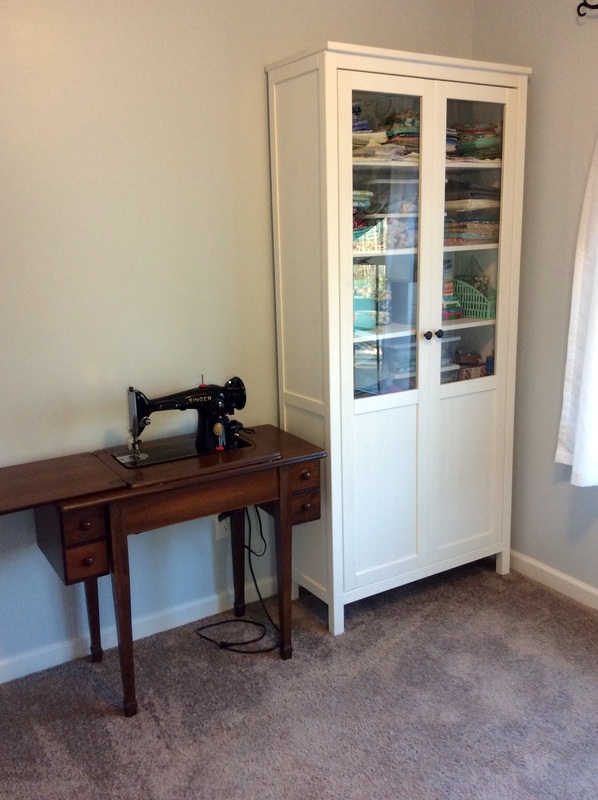 Besides converting our living/dining room space into a workshop for James, we have been transforming one of our spare bedrooms into a craft room for me. A few months ago, I started off by painting the walls in Behr Premium Plus Ultra Exterior Satin Enamel in the shade Cumberland Fog – a lighter blue. We have actually had great results using exterior paint indoors. Our entire house was originally painted in some type of Sherwin Williams formulation, but whatever the builder used – it was terrible. If you put your hand on the wall (no matter how clean it is) there will be fingerprints and oil left behind. We’re going to have to eventually repaint the ENTIRE house. However – by using exterior paint in a satin finish – the paint job is more durable than using interior paint and the walls are super easy to clean. Yes, it will cost a few dollars more per gallon, but in our opinion – it is worth the money for longer lasting results. If you choose a high quality paint, the outcome will be just as good if not better than the typical interior paint. 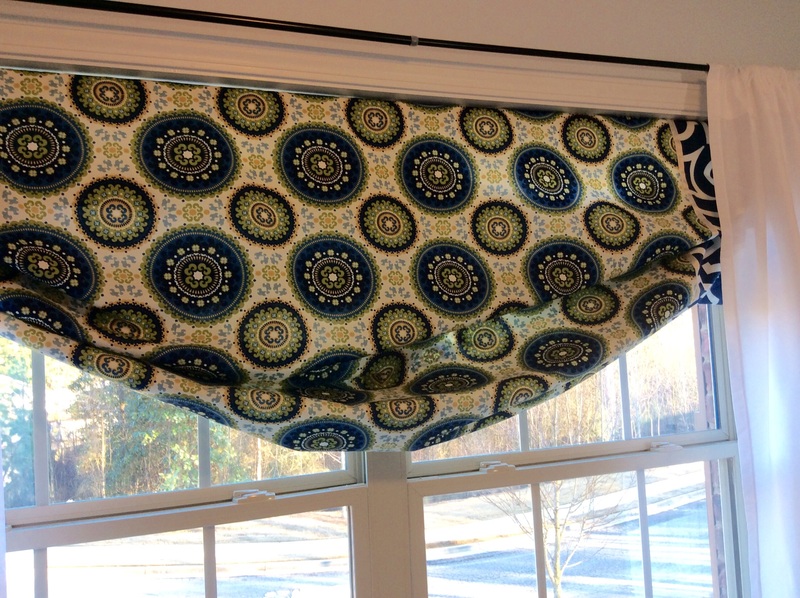 This is my attempt at making a roman shade. I did make a bit of a fatal error in not sewing my dowel rod pockets through all layers of the shade (doh!) 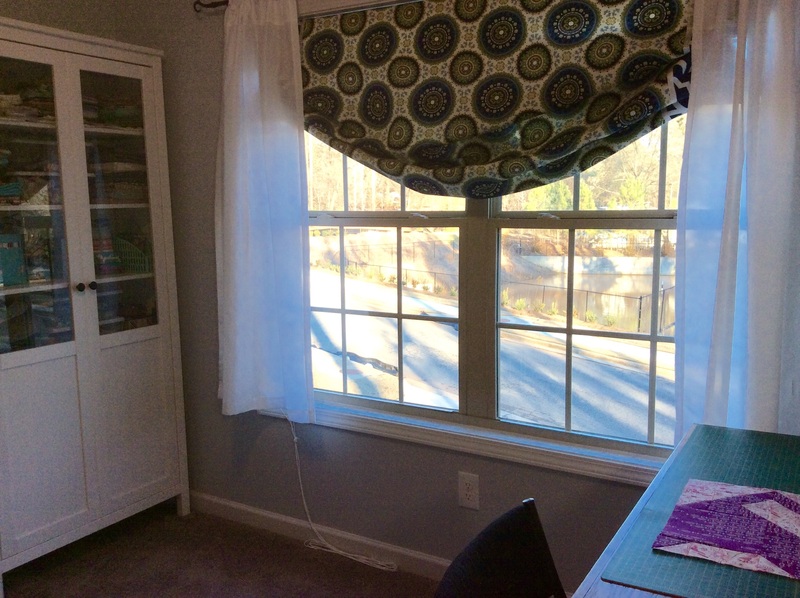 so now it’s more of a “relaxed roman shade” that stays in the upright position. It can be lowered, but when it is – the room is very dark. The curtain rod and white sheers are (believe it or not) from Kmart. The tall white cabinet is from Ikea’s Hemnes collection – it was extremely marked down in the As-Is room. The fact that it was already assembled, a floor display, and in perfect condition – made it an easy decision. The top shelves of the cabinet house part of my fabric stash, rulers, thread, containers full of notions, and some random gift items and stationary. 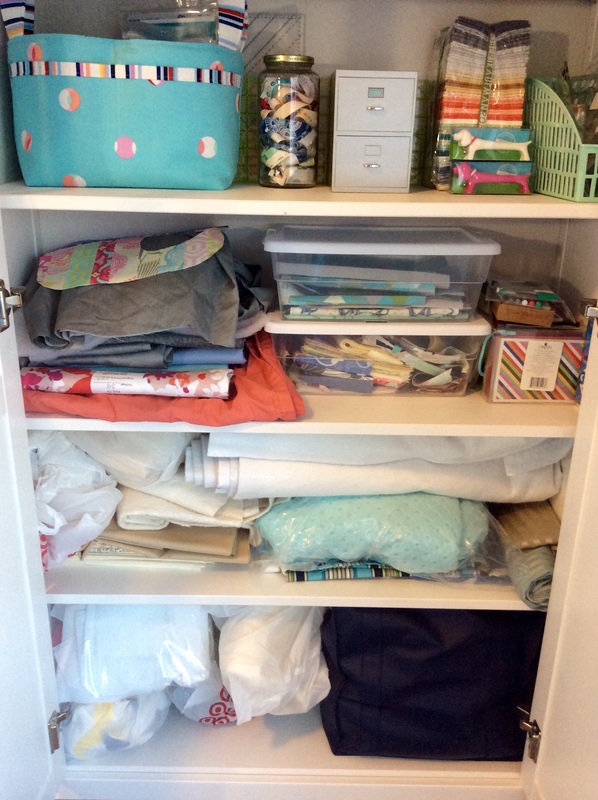 Here are the bottom shelves where I store larger cuts of fabric, batting, and minky fabric. Next, I have to show off the wonderfully large craft table James built for me. 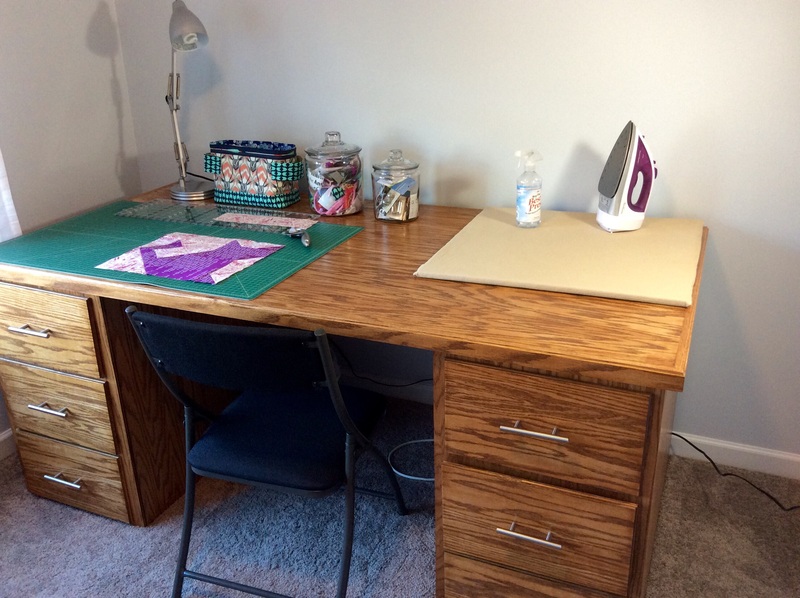 It fits my pressing board, 24 x 36 cutting mat, lamp, sewing supplies, and my machine will go in the open space in front of the pressing board. I’m considering possibly open shelves and some type of art on the wall above the table so I have something inspiring to look at while I’m working. I love how he finished the wood so the grain is really a statement about the table. It has six large, deep drawers that will house *lots* of sewing supplies. 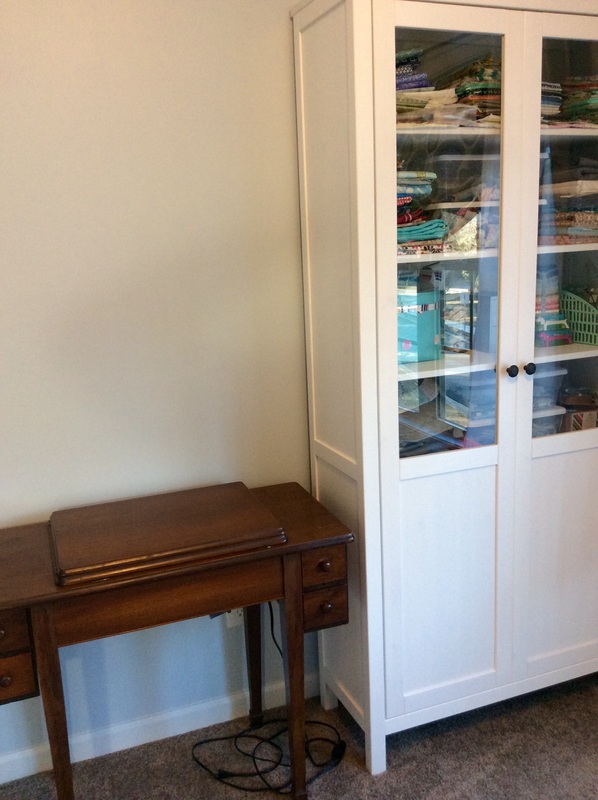 Another view of the table facing the closet – which is where I keep bolts of batting and interfacing, my Cricut Expression, another plastic shelving unit that holds non-sewing craft supplies, and some finished projects/quilts. 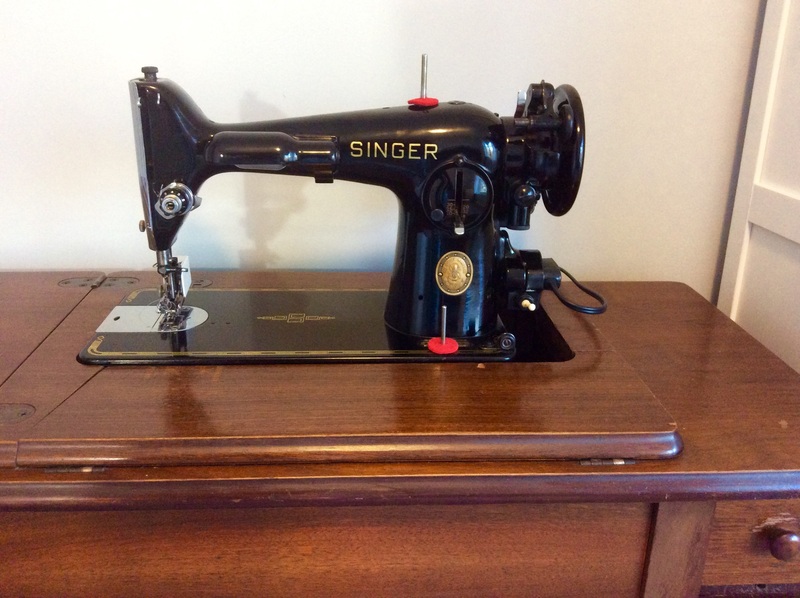 This was the first sewing machine I bought – a vintage Singer 201-2. It came with a free cabinet to house it in. Here’s a few of the table with the machine tucked away inside. 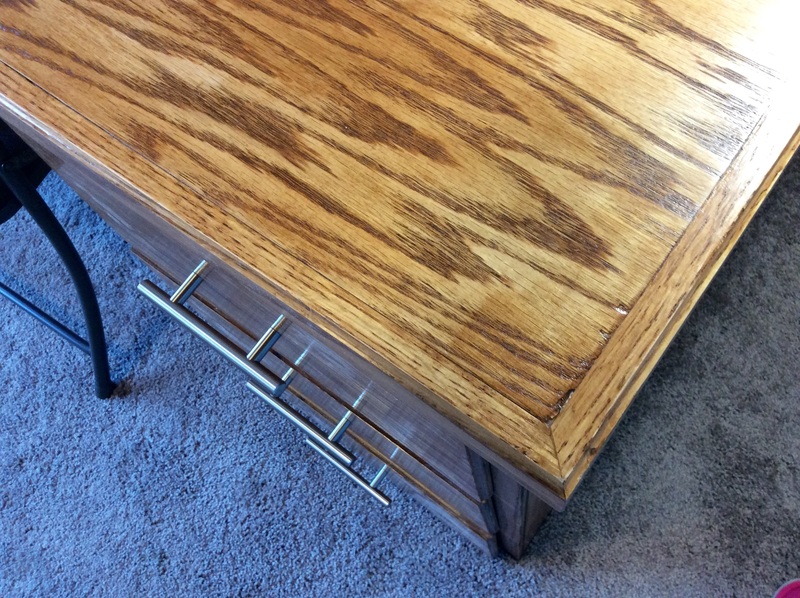 For being an old table, it sure has a lot of cool features – like a spot to hold the foot pedal that turns it into a knee lift. 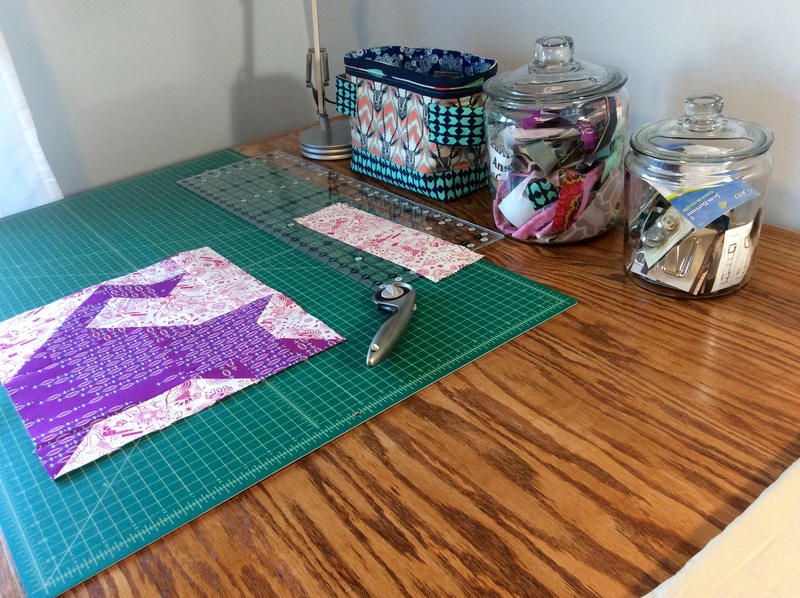 Today, I am participating in FreshlyPieced.com’s WIP Wednesday! 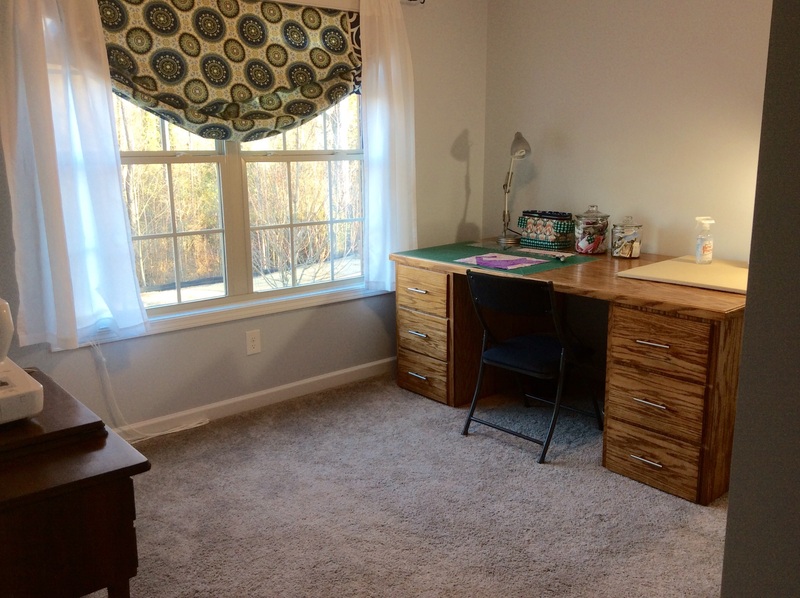 2 Responses to "Work in Progress: The Craft Room"
What a neat sewing room. Your husband is very skilled. Mine didn’t volunteer to make me a sewing table so I’m making my own. lol I’ll have to hop over now to see what you did with the living room for him. 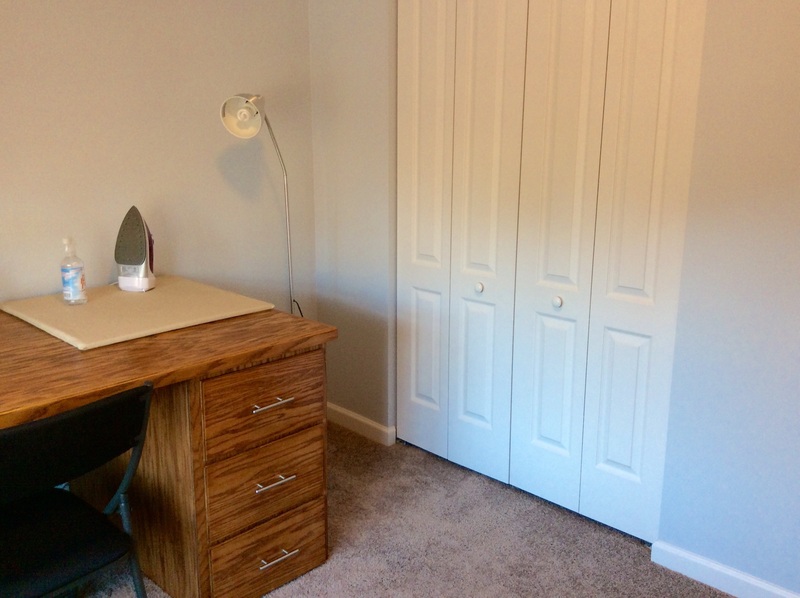 That’s the room I took as my sewing room as there weren’t any other rooms available. How fun! 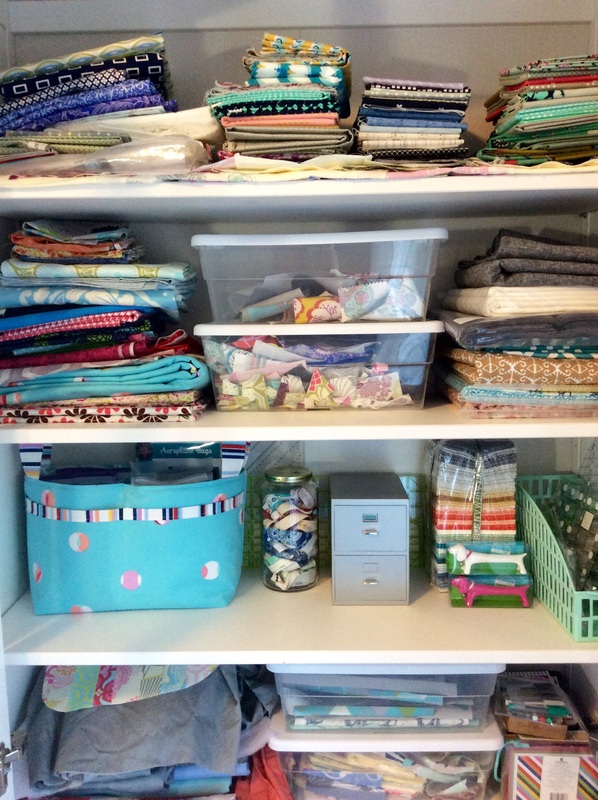 I love seeing the studios and spaces of other quilters and crafters.